Located in the Railroad Addition, the E. C. Kane House was built about 1886 and enlarged in the 1890s. 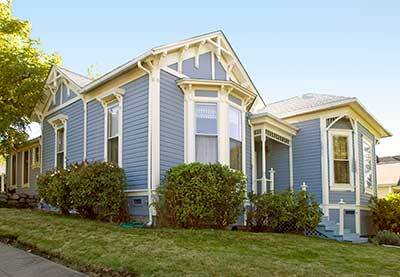 It is a modest dwelling combining its original Italianate elevations with additions in the Eastlake style. Architecturally, it is typical of houses in the Railroad Addition, but it is among the first houses built in the neighborhood. E. C. Kane was the original station master for the Oregon and California Railroad. Ashland was the mid point on the main rail connection between Portland and Sacramento. Situated at the base of the Siskiyou Mountains, not far from the Oregon-California border, Ashland has served historically as a mountain division point. When construction of the final link through the Siskiyous was completed in 1887 and duly marked with last spike ceremonies at Ashland, the division point became the base for innumerable crewmen, conductors, clerks, freight handlers, and firemen. As station master, Kane supervised all personnel handling freight and passenger traffic and telegraph communications. Adapted from the NRHP nomination submitted in 1986.